Have you been to a Chinese restaurant like P.F. Chang’s? Because the Chinese are one of the most widely traveled people in the world, the chances are high there’s a Chinese restaurant in your area. It also helps that Chinese cuisine is well-loved anywhere in the planet. If you have never been to a Chinese restaurant, then you could be in for a surprise with how they do things there. The Chinese are fond of drinking tea, and this is served first before any other food is brought to the dining table. Of course, you may have heard that the Chinese use chopsticks, but if you don’t know how to use one, how would you be able to eat? Read on and find out how you can ‘survive’ your first Chinese restaurant experience. The first thing you’ll have to get acquainted with is the table setting in a typical Chinese restaurant. You’ll notice a small teacup, small plate, rice bowl, and chopsticks. The small teacup is obviously for tea, while the small plate serves as place where you can dump bones and other inedible parts of whatever food you would eat. Chinese restaurants are very strict when it comes to the use of disposable wooden sticks. The rule of thumb is that spoon and fork are only given when everything else fails. So try the chopsticks first and when you can’t really use it well, then ask for a spoon or fork. When eating rice, bring the rice bowl close to your mouth and quickly scoop the rice using the chopsticks. If you have never been to a Chinese restaurant, one of the first things you should know is the rule when it comes to drinking tea. When you sit at a table in a Chinese restaurant, you should be courteous by pouring tea for people around you before filling your own teacup. In fact, even if the teacups of the people around you are full, you are still expected to pour a little into the cups as a form of courtesy. There is also an order when it comes to serving tea. The rule of thumb is to serve tea to the oldest person in the table first, to be followed by the next oldest person, and so on. So if you are with grandparents, they’ll be the first to have their tea cups filled, followed by parents, and so forth.If someone filled your cup, you can show your appreciation by tapping your two fingers on the table. Once everyone has finished their tea, the food will come in. These are called entrees, or shared dishes that are served in bowls. It is part of the Chinese custom not to pass around the dishes, and that everyone will have to reach for the food they’d like to have. In case you could not reach the food you want, politely ask for someone to help you out. If you happen to be invited by someone to a dinner or lunch at a Chinese restaurant, you should not choose the food. That ‘privilege’ is only given to the host. As a guest, all you have to do is to show up and eat whatever is served in front of you. Don’t worry, though, since the Chinese are very generous when it comes to eating. This is assuming that a Chinese friend or colleague invited you to a Chinese restaurant. The Chinese people are known for being generous with food that they tend to order a lot of dishes when they are in a restaurant. Expect at least 10 dishes that will be served in front of you at a Chinese restaurant. Don’t be overwhelmed by the number of dishes that will be served in front of you. Consider eating at a Chinese restaurant as a marathon, and not a sprint. Eat slowly. In fact, in China, it is a norm to have breaks in between meals. Thus dinner or lunch could take more than two hours in a Chinese restaurant. For dessert, Chinese restaurants usually serve watermelon, apple slice, fried sweet pumpkin, and even sweet potato pancakes. Once the meal is done, the host will say ‘zo!” which literally means “go!” This is also an order for everyone in the table to stop talking and eating. When you hear the host say this, you are expected to rise and leave the table. 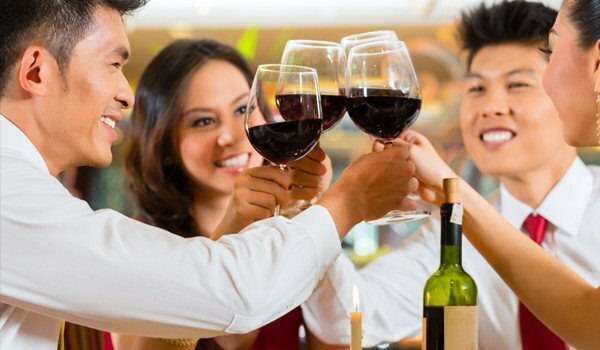 In Chinese restaurants, it is considered impolite for guests to linger after meals. Finally, the host is the one who is responsible for the bill. Don’t even attempt to get the bill from the waiter and offer to pay for a portion of the meal. There is no such thing as “Dutch Treat” in Chinese culture, and the host will never allow you to shell out even a cent for the food you ate. Whether you have been invited to an authentic Chinese restaurant or establishments that specialize in casual Asian dining like Genghis Grille, remember these tips so that you won’t look like a bonehead when chomping on Chinese dishes.